MVP? Validation? Where Do I Start and What Does It All Mean? You’re an up-and-coming entrepreneur, or an eager “wanna-preneur” with a strong app idea. You want to develop your app in a cost-effective manner, but your web search for guidance on app development has left you inundated with information. Now you’re not quite sure where to start to solidify your app idea into reality. You’ve heard the buzzwords “MVP” and “Validation” but have no real grasp of what these terms mean. It’s for folks like you that we put together this concise and distilled visual tour. So, there you have it. 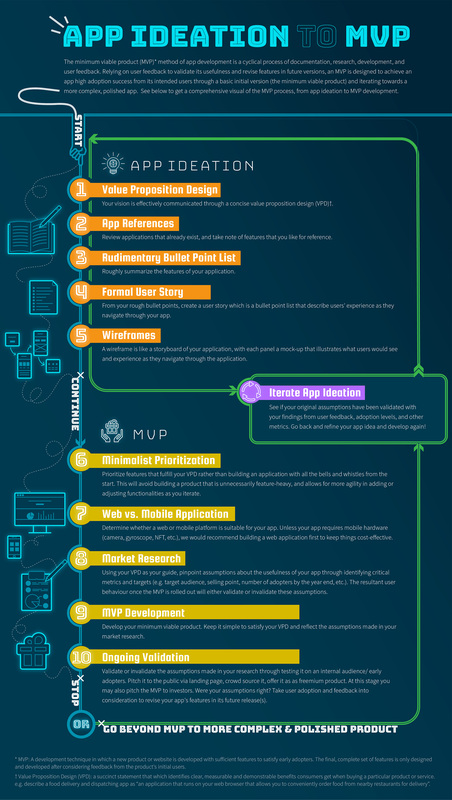 A comprehensive guide to MVP development to help ease you into your journey of tech entrepreneurship. Following good ideation practices, an MVP is conceptualized with a clear value proposition in mind. It is then planned through documenting the MVP’s feature and visual requirements. An MVP is essentially a working and basic execution of your app concept. It’s a cost-effective product that is first built, designed to be simple but effective. Its proposed value (as formalized through assumptions made in market research) is validated by early users whose behaviour and feedback drive its iteration towards a more complex and polished product. The MVP methodology follows a build-learn-repeat process that keeps app development cheaper, more agile and more impactful to your app’s intended users. Do contact Gravit-e for MVP consultation and app development!